Have you ever seen a home that made you stop in your tracks? A home where every aspect and component seemed just right? For many homes, perfect can’t be achieved without the perfect roof. And for many homes, cedar shakes or shingles are the perfect complement to the overall architecture, look, feel and construction of a historic home. At Custom Shingles, we work each day with historic homeowners who are seeking perfection and who need the right roofing materials to achieve it. With more than 35 years of experience, we know how to take your vision for a new and beautiful roof and how to make that vision become a reality. The challenge with non-traditional roofing is that many times homeowners know they want it but they don’t know how to articulate exactly what they’re looking for. We make sure that you get the look, the quality and the durability you expect when you choose a cedar shingle or shake roof for your home. Read on to learn more about cedar shingles and shakes and whether or not they’re the right fit for your home. What Are Cedar Shingles and Shakes? 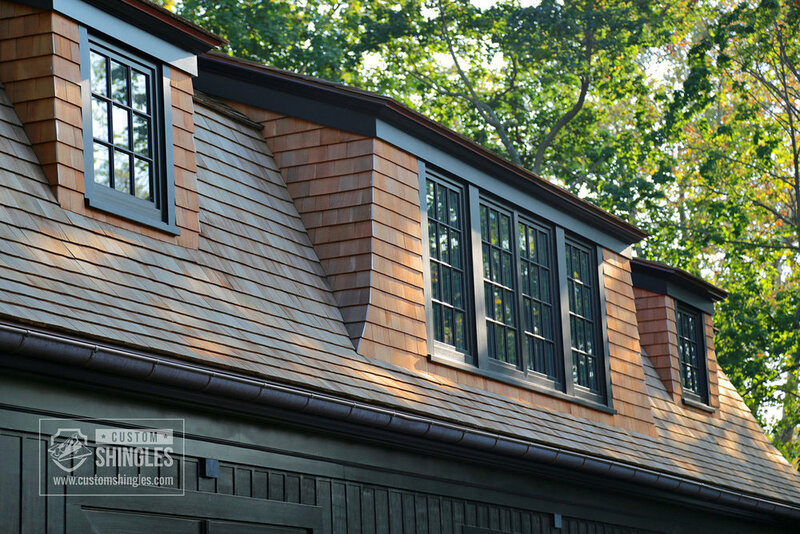 Custom cedar shingles and shakes deliver a charming and timeless beauty to homes that evoke historic architecture. While both shingles and shakes are sawn to be smooth and to deliver an aesthetic that's slightly more refined and tailored than ordinary roofing, there is a distinction between the two materials. A shingle is what you typically see on most homes. Shingles are sawn on both sides and they are typically thinner than shakes. A shake, conversely, is split rather than sawn on at least one side and sometimes on two sides. There is one key exception to this definition, which is any shake that is tapersawn is actually sawn on both sides. They are classified as shakes only because the application process is so similar to that of a traditional shake. 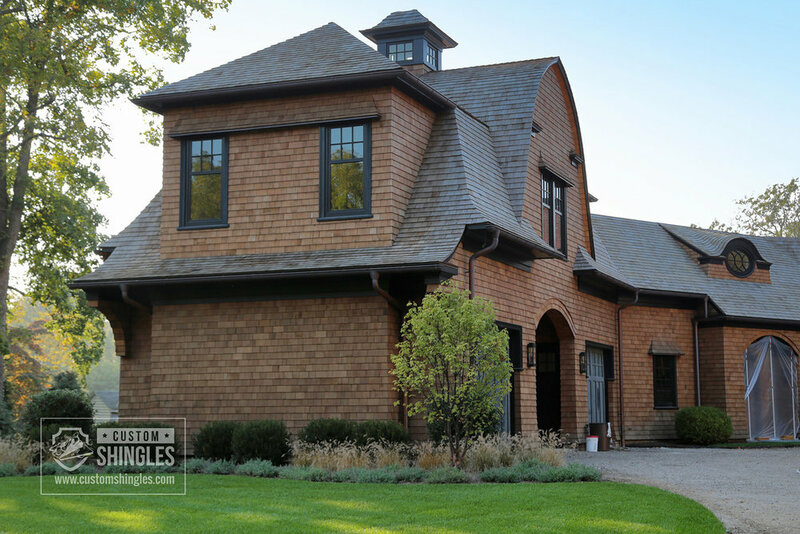 At Custom Shingles, we typically deal in Certi-Split® Handsplit and Resawn Shakes that are made to meet high quality standards and that offer a rustic appearance that comes from their rough split face — the side that’s exposed. Cedar shakes are popular additions to vacation and ranch homes, where their rustic spirit is fully at home. Whether you’re choosing specialty cedar shingles or shakes, you’re getting the power and beauty of cedar construction. Cedar wood used to build roofs can make a roof last much longer than more traditional materials. Also, cedar gives you the opportunity to stain your roof any color you desire, either before installation or after. That is, if years down the road you want to change your stain color, you can do it with cedar without having to replace the entire roof. The greatest benefit to a cedar roof is the unmistakable beauty. Homes throughout the country use roughly the same roofing materials and none of them really make an impact on visitors or passersby. Cedar is different. No matter what color of stain you choose, decorative cedar shingles enhance the beauty of your home and make an incredible first impression on any who sees it. Cedar is also durable, which means you’re going to enjoy a much longer lifespan than you would with more traditional roofing materials. Cedar shakes and shingles are going to be able to withstand significant storms and harsh weather conditions — and you’ll certainly get an attractive return on your investment in a cedar roof. Finally, cedar shingles and shakes are more energy-efficient than more traditional roofing materials. Your home is always losing conditioned air. Hot air escapes in winter when you're trying to keep your home warm and cool air escapes in summer when you're trying to keep your home cold. The only question is: How much conditioned air are you letting escape? Conditioned air can escape through walls, windows, poorly weather-stripped doors and even electrical outlets. But your attic and roof are the biggest culprits. You can add insulation to your attic to make your home more energy-efficient, but a cedar roof is going to make a huge difference in better controlling your heating and cooling costs. Cedar is more attractive, more durable and more energy-efficient than most other materials you can choose for roofing — especially more traditional materials. Cedar shakes and shingles are going to cost more than traditional roofing materials, but that’s understandable when you consider that you’re going to get many more years. You often get what you pay for, and cedar offers incredible value when you choose to make an investment in this beautiful and durable roofing material. The one added duty with custom cedar shakes and shingles is regular maintenance. You'll need to take active measures to ensure that mildew, moss, mold and other growths don't appear on your specialty cedar shakes or shingles. You can conduct this regular maintenance or you can have anti-growth preservatives added to your decorative cedar shakes or shingles prior to installation. Cedar shingles are versatile and they make a good fit on most era-appropriate homes. If there’s one style of home that’s most likely to complement cedar shingles nicely, it’s Nantucket-style cottages and older coastal homes. While the harsh salt air can be damaging to red cedar, a high-quality stain can prevent any discoloration in the long run. New England shingle homes and Nantucket-style cottages are perfect for cedar shingles, but don’t be afraid to explore them as an option even if you own a historic home that’s nowhere near the ocean. Cedar shakes are a little bit different. As mentioned above, they are more rustic in appearance given the split rather than sawn face they offer. This makes cedar shakes ideal for ranch-style homes, vacation homes in rural areas, homes in the hills or mountains, as well as homes in similar settings. Believe it or not, when you add hundreds of cedar shakes to a roof, the power of the split face shines through and makes a perfect impression on those who see your home. Very few professionals in the country can do what we do at Custom Shingles. We don’t consider your roof simply another job. We consider it an opportunity to create a work of art. Something that commands attention and that fits seamlessly into the overall architecture, look and feel of your home. That type of service and those types of results demand care, attention to detail, knowledge, experience and a deep desire to go above and beyond. That’s exactly what you can expect from Custom Shingles when you choose us as your service provider. We make things as easy as possible on you and our other customers by offering free estimates, design assistance, roof assessments, inspections and more. When you want the most beautiful roof possible and the work is too important to be done improperly, trust the team at Custom Shingles. Or, if you need help to replace historic cedar shakes, Custom Shingles can help in those situations, too. 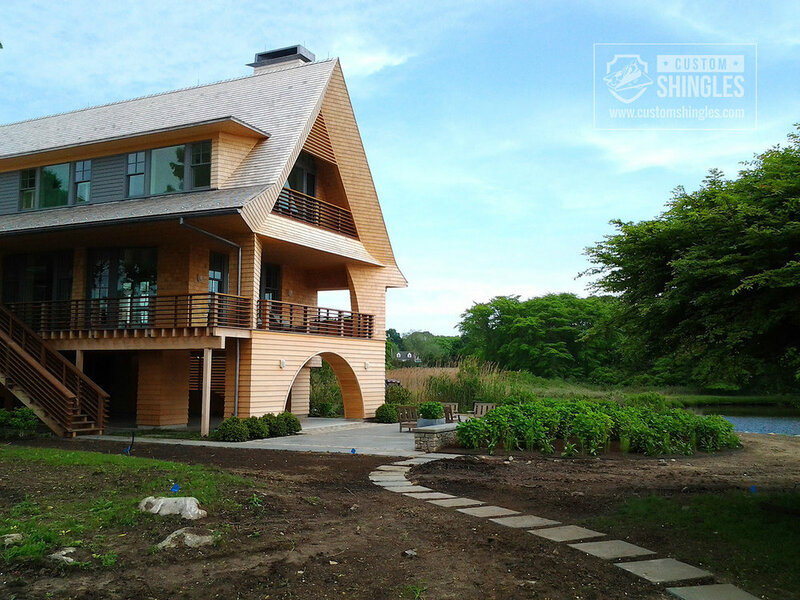 We are incredibly proud of the work we’ve done installing cedar shakes and shingles. We know that seeing is often believing when you’re considering a significant upgrade to your home — an upgrade like cedar shingles and shakes on a roof. We invite you to see just a few of the many homes on which we’ve installed these beautiful, durable roofing materials. Who knows? You may find inspiration in one of these photos. Sometimes it’s easiest to say: “I want my home to look like the one in this picture.” Or, perhaps one of these photos can serve as a conversation starter as you consider your roofing options. Either way, visit the Portfolio tab above and choose the material type you’re most interested in from the dropdown menu. Then, just click and you’ll be able to see a wide range of homes that now have beautiful custom cedar shingles and shakes. Why choose to work with Custom Shingles? Because we are the premier provider of custom wood shingle roofs. This is more than just a trade — it’s an art form. Today’s custom wood roofs provide an old-world charm and beauty, and it’s a challenge to create such a charming and beautiful roof that provides an appearance that enhances the rest of your home while providing durable performance for decades to come. The look and feel of a historic custom wood shingle roof is elusive, and many architects and builders search far and wide to find a provider of custom wood roofs who can see an ambitious vision through to reality. That's what we do at Custom Shingles: we spend the time it takes to understand your vision for a custom wood roof. And then we use our knowledge, experience and skills to make sure you get outstanding results that exceed even your wildest expectations. Are you ready for your quote on specialty cedar shingles and shakes? Or, do you need help to replace historic cedar shingles and shakes? Simply fill out the quote request form here and we’ll get back to you as quickly as possible with an estimate.